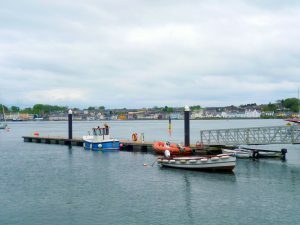 Strangford Lough in Northern Ireland is Britain’s largest sea lough, covering 58 square miles. It runs north to south with the long, narrow Ards peninsula running down its eastern side between the lough and the Irish Sea. 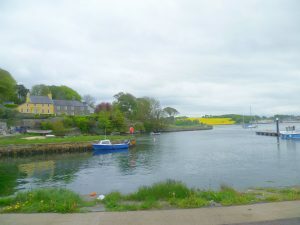 At the lough’s south-eastern edge a narrow channel leads to the sea; with the picturesque little port of Strangford on the west side linked to Portaferry on the Ards peninsula by a car ferry. 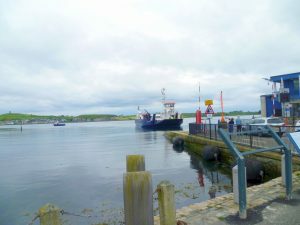 The ferry between Strangford and Portferry has been running for nearly 400 years and, nowadays, the crossing takes about eight minutes. It saves the traveller a round trip of forty-seven miles which takes about an hour and a half. Last week, I found myself in Strangford and was instantly charmed by the little harbour, the green behind it and the attractive rows of cottages, all beautifully kept. 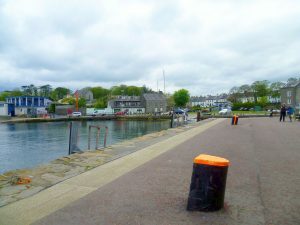 It was a lovely place to stroll around, or just to sit on the benches facing the sea and watch the car ferry leaving Portferry, crossing the narrow strait, and coming into Strangford harbour. It is also a place steeped in history. King Magnus III of Norway, (known as ‘bare foot’) an aggressive Viking determined to expand his territory, arrived in Ireland in 1098 and built a fort at Strangford. He could see its potential immediately; the lough itself offered both access to the interior and an escape route to the sea. Magnus’s fort has long since disappeared but later attackers (and defenders) have obviously seen the same potential. 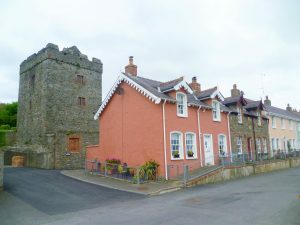 There is a 16th century three storey tower near the harbour, with the, surely, aspirational name of Strangford Castle. It is, in fact, more like a broch than a castle in that there appears to be no access at ground level; access must have been via ladders. There are gun loops on the ground floor, a blocked door at first floor level, and a crenelated roof with more gun loops and that’s about all we know. But whoever built it plainly thought that Strangford was worth defending. 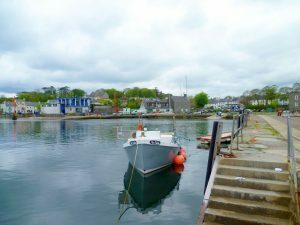 Nowadays, Strangford is a popular place with visitors and it’s is a delightful place to wander round. The lough itself is a Marine Conservation Zone, and there are numerous sites of archaeological interest around its shores: at least three castles, a ruined abbey, the remains of a monastery, and several stately homes, not to mention the Wildfowl and Wetland Trust – for the lough is tidal and wading birds love it. And, as a final treat in this picturesque place, I discovered a shop with the most delicious home-made ice cream!